Bacton is a sizeable parish on the northeast coast of Norfolk. It stretches inland from the North Sea to North Walsham and is sandwiched between Paston to the north and Witton to the south. Its name comes from the Old English ‘Bacca’s Enclosure’. The parish has been in existence for a long time, and was certainly around before the Norman Conquest, its population, land ownership and productive resources being detailed in The Domesday Book of 1086. There is evidence of human activity in the area from the earliest prehistoric times, although this evidence is by its very nature fragmentary. A Palaeolithic flint handaxe and worked flakes (NHER 6897) were reported to have been found before proper records were kept and a Mesolithic axehead (NHER 6898) was found in 1960. Individual Neolithic finds, still confined to flint tools, are a little more numerous. Several Neolithic axeheads have been found (for example, NHER 6900, 6902, 7080 and 39959) either partly polished or wholly polished (NHER 21189). More importantly, the Neolithic gives us the first evidence of human settlement in the parish. A rare and important site at Bacton Wood Farm (NHER 6899) was occupied from the Neolithic through to the Bronze Age (and probably beyond) and has yielded large numbers of flint tools, pottery fragments, copper alloy artefacts and human remains. Also found on this site was a burnt mound or pot boiler site. These are prehistoric but undateable collections of burnt flint that may have been used in food preparation. They are not uncommon in certain areas, and there are other similar examples in the parish, including three in Bacton Wood (NHER 3116, 3117 and 3118). Individual Bronze Age finds in the parish include a barbed and tanged flint arrowhead, the tip of a copper alloy spear and a copper alloy axehead. During this period, there was a change in burial practices, with at least a proportion of the population’s dead being interred in burial mounds or round barrows. These were circular mounds with a surrounding ditch (and sometimes more than one), from which the soil for the mound was dug. The dead were placed in these barrows, either as an inhumation or in urns after being cremated. Often, several burials were placed in the barrow at different times. Cultivation of the soil over the centuries has led to most of these barrows being ploughed flat and therefore invisible from the ground. However, the remainder of the surrounding ditch often shows up from the air as a darker circle, and this has led to the tentative identification of several ‘ring ditches’ in the parish. Examples of these can be seen at NHER 6904, 2778, 16014, 16653 and 38994. A probable barrow cemetery, with five ring ditches and a possible square Iron Age barrow, is at NHER 6914. Apart from this possible square barrow, there are only a few field systems speculatively identified to the Iron Age (for example, NHER 39032), and these may equally be of Roman date. There are also relatively few remains from the Roman occupation in the parish. Two cremation urns were reported as being found in 1826 (NHER 6907) and there have been several finds of pottery fragments (for example, NHER 25022). Metal finds of the period include a coin (NHER 34833) and part of a harness fitting. Metal detecting in recent years at the Bacton Wood Farm site (NHER 6899) has recovered Roman coins and a brooch. The only other possibly Roman features are those identified from aerial photographs. These include a field system (NHER 39097), an enclosure (NHER 39204) and a trackway (NHER 39110). Following the departure of the Romans, the archaeological record is almost silent until the Norman Conquest. Only a few Saxon pottery fragments (for example NHER 6902) and a Saxon coin pendant found on the beach in 1845 (NHER 6881) are recorded. The medieval period following the Norman Conquest has left the earliest surviving buildings in the parish, and these are, as is usual, ecclesiastical in origin. The most important is Broomholm or Bromholm Priory (NHER 1073). 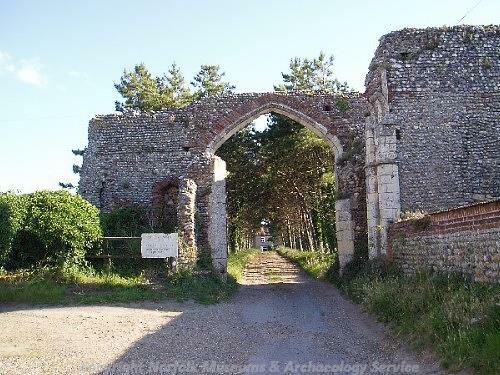 Founded in 1113 and dedicated to St Andrew this was initially a subordinate Cluniac house to The Priory at Castle Acre (NHER 4096), but came under direct Cluniac rule in 1196. It became very famous in the 13th century as possessing a relic of the Holy Cross, and was visited on several occasions by Henry III. Aerial photographs have revealed that the Priory was once very extensive indeed, but after its dissolution in 1536 much robbing of the stonework took place. However, the ruins today are still impressive and include two gatehouses, part of the precinct wall, the north transept (reinforced in World War Two as a strongpoint - see below), chapter house and dormitory. The picturesque All Saint’s church (NHER 6916) in the village of Edingthorpe to the west of the parish has a round west tower dating to the 12th or 13th century, but the north and west walls of the nave are even earlier, being late Saxon or early Norman in date. The rest is mainly 14th century and there are rare wall paintings of the time in the nave. The oldest part of St Andrew’s church (NHER 6915) is the Norman stoup, but the rest of the church is 14th century, with a 15th century west tower. Inside is a fine 14th century font, and wall paintings of about 1600. The other medieval church in the parish, St Clement’s was in the coastal east part and was ruined by sea action in 1386. It foundations were then washed away in 1760. A portion of the churchyard remains, however, and human remains have occasionally turned up during works. Other possible medieval sites have been identified by aerial photography, and include field systems (NHER 39202), a possible moated site (NHER 35550), a roadway (NHER 6964) and a water meadow (NHER 38793). Bacton Wood itself (NHER 39749) is noted as being managed in the medieval period and has boundary banks, ditches and diggings from the time. Quite a few residential buildings survive from the post medieval period after the Dissolution, although of course much altered and extended. As mentioned above, much of the stonework from Bromholm Priory was robbed after it was dissolved in 1536, and pieces of it can still be seen, reused in later houses. For instance Bacton Manor (NHER 15114), a late 16th century thatched house, has stone from the Priory in its fabric, as do numbers 1 to 4 Keswick Road (NHER 14145). Other post medieval houses include Edingthorpe Hall (NHER 11571), a 16th/17th century Jacobean hall, Pilgrim House and Barn (NHER 11564), Bromholm and Garden Cottages (NHER 11565), The Grange (NHER 11569; a thatched brick house with a datestone of 1693) and Arthur’s Barn (NHER 11570; an 18th century thatched brick barn). Turning to industrial buildings, Bacton Wood Mill (NHER 11572) is an impressive three storey watermill built in about 1780, with a miller’s house attached. Although now converted to residential use it is thought that much of the old mill machinery remains. Other industrial sites, like a brickworks (NHER 6918) and a brick kiln (NHER 15849), have been noted as they appear on 19th century maps, but no trace of them remains today. In the 20th century, coastal East Anglia was perceived in both World Wars as a potential invasion point and various defensive structures were constructed. In World War One, these tended to be round concrete pillboxes, which were often destroyed at a later date. However, there are two rare survivals in the parish, at NHER 17017 and NHER 32625. Other World War One records include two shipwrecks of unknown vessels (NHER 18663 and 34155) and the site of a Royal Naval Air Service landing ground (NHER 13613). In World War Two the threat of invasion was far more serious and the defensive measures taken in 1940 were correspondingly massive. The development of the tank and other mechanised transport in the inter war years meant that pillboxes were now part of an integrated invasion defence system, together with anti tank blocks and ditches, road blocks, mined areas and a great deal of barbed wire. Defences were built to form a coastal ‘crust’, and then in successive ‘stop lines’ inland, along rivers and other natural features. Being a coastal parish, a large number of pillboxes and other defence structures were built, and quite a few survive today. As mentioned above, the north transept of Bromholm Priory was reinforced with concrete and converted to a strongpoint, which can still be seen. Examples of pillboxes are at NHER 17014, 17015, 32626, 32628 and 32632 and a section post is at NHER 17016. A group of anti tank blocks is at NHER 32635, and anti tank mortar bases are at NHER 32624 and 32627. It must also be remembered that the region saw a great deal of air activity at the time, with regular casualties. There is an aircraft crash site at NHER 19609, where a Lockheed Hudson crashed in 1942. After the war, most of the military installations were removed, leaving no visible trace today. However, aerial photographs taken in 1946 before their removal show the sheer scale of military activity in the area. In Bacton alone, there were training areas and camps (NHER 38829 and 38999), weapons pits, barbed wire and trenches (NHER 38985 and 38986), anti tank emplacements (NHER 38791 and 38989) and anti aircraft landing ditches (NHER 38990). All in all, this is a parish with a long and fascinating record. Pieter Aldridge (NLA), 7th November 2005. Bird, C., 1995. ‘Fixed Defences of Norfolk’, Journal of the Norfolk Industrial Archaeology Society 5, No. 1 and 2.